Wiki Loves Monuments kicked off in its fourth year! 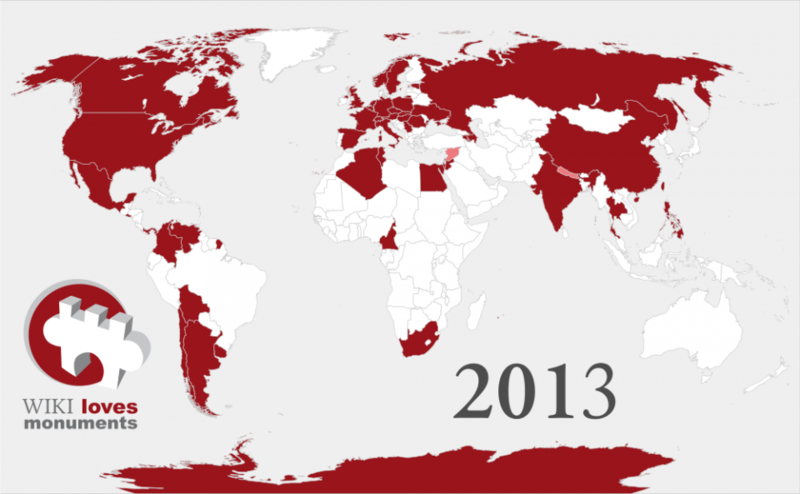 Since September 1st, more than 50 countries from all over the world are in the race to show the best pictures of their heritage to the world through their participation in Wiki Loves Monuments 2013. This year we are very excited to have for the first time Arab speaking countries join: Algeria, Jordan, Tunesia and Egypt all joined for the first time! But also in Asia the contest sees more participating countries, with China, Taiwan, Hong Kong, Nepal and Azerbaijan. Also, the only continent without a permanent population (but with monuments! ), Antarctica, is participating this year. But even in Europe where the competition started we’re able to welcome new participating countries, such as Armenia and the United Kingdom. The biggest country participating is Russia, and the smallest is Aruba. It has been a very interesting first week for all participating countries, and while it will take a lot of effort, we’re still on schedule to break our own World Record recognised bu the Guinness as the largest photography competition in the world! [LINK So far we are exceeding the number of pictures received by this same day last year and the number is raising. Especially encouraging is the enthusiasm with which some mega-uploaders are trying to photograph as many monuments as possible, and upload all their photos during September. This particularly boosts the number of images uploaded in Germany, Spain and Poland! The enthusiasm and successful uploading on itself is a prize that encompass the effort of hundreds of volunteers worldwide that assume the challenge of organizing Wiki Loves Monuments in their countries. Bravo to all 50+ teams that took this challenge and good luck in the coming weeks! There are still three more weeks to go and the results look promising. Check out the participating countries, and don’t miss the opportunity to participate in the largest photography contest in the world. “Also, the only continent without a permanent population (but with monuments! ), Antarctica, is participating this year”. Villa Las Estrellas is a Chilean town located about 1580 km (about 990 miles) south of Punta Arenas, on King George Island, opposite to the Land of O’Higgins. Together with Sargento Cabral Pillbox in the argentinian base Esperanza are the only stable civilian populations in Antarctica.